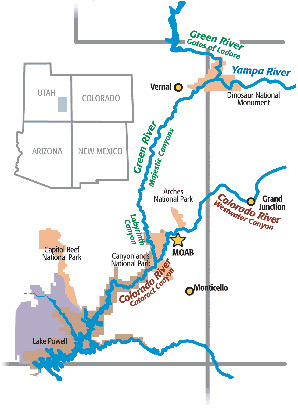 The Colorado River is the lifeblood of the entire southwestern United States. Its powerful waters, which start high on the Continental Divide in Colorado, surge down the mountains and through America’s great Southwestern deserts all the way to Mexico. The river feeds thousands of communities along the way. Hidden along its path are wonderful steep-walled canyons that were carved by this powerful force of nature over the thousands of years. To experience the Colorado River up close and personal, on a few-day Colorado River rafting trip or a week-long Utah river rafting family vacation, is a lifetime experience not to be missed. The river’s heart pounding rapids and gentle, soothing flows are just the vehicle for your transport into a world beyond anything familiar. The 2,000-foot-high red rock canyon walls reveal a fresh, amazing view with every twist and turn. Soft, sandy beaches offer secluded living spaces where you’ll reconnect with family and friends. Side canyons that feed the main river reveal a lush, green oasis that defies any ideas about the desert. We’ll hike alongside fresh, clean water that trickles through red stone sculpted so smooth it looks like marble. You’ll discover thriving plants, see ancient Indian ruins and possibly view a pristine waterfall. The light changes every minute, casting shadows and shining brightly on nature’s amazing beauty. You’ll enjoy the best river cuisine on our rafting trips. We choose fresh meats and cheeses from a local deli and pack produce from our homegrown garden. Think expertly grilled steaks, crisp salads bursting with veggies, fresh fruit at every meal and full breakfasts with eggs to order. Delicious! Our level of service extends to every part of your Colorado River vacation. We operate clean, air conditioned vehicles. Don’t expect a bumpy ride to the river in a school bus! Our cozy sleeping bags and pads, tents and camp chairs are cleaned before every trip. Our boats and every other piece of equipment are replaced on a strict maintenance schedule. Sheri Griffith River Expeditions also provides unparalleled, customized service. We make great strides to accommodate every request. We arrange speakers, rearrange trip dates when needed, and serve small groups. Our base camp includes a second, completely Kosher kitchen. We accommodate vegetarians, vegans and prepare gluten free meals. Whatever you need, just ask! Cataract Canyon — This 2-5 day journey through Canyonlands National Park’s spectacular, remote wilderness is one of the best river vacations available. Big whitewater is punctuated by gently flowing sections to provide a total river experience to those who travel here. 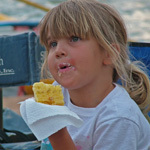 Sandy, secluded beach camps offer multiple activities, such as horseshoes on family river trips. Longer trips enjoy hikes full of discovery and plenty of time for contemplation or personal connections with family and friends. Sights of Cataract Canyon by Oarboat — The traditional mode of transportation on the Colorado River places you up close and personal with your surroundings on this 4-5 day trip. 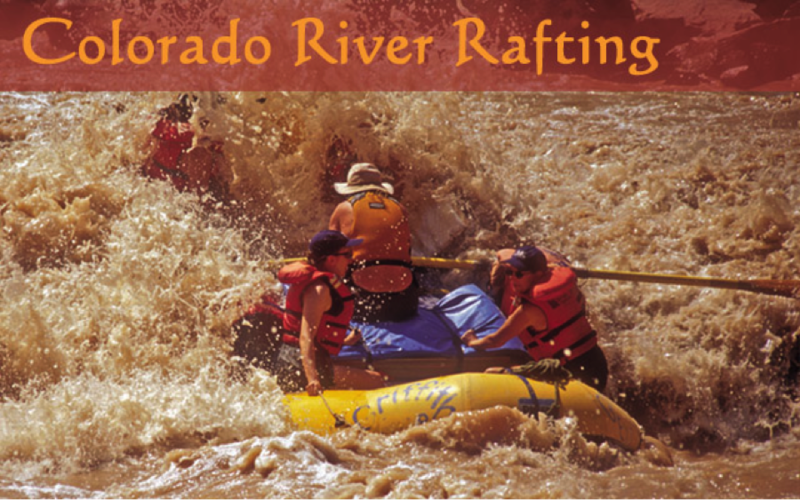 We provide all the comforts needed to enjoy the outdoors on this Colorado River rafting adventure. There’s plenty of time for daily hikes up secret canyons only accessible from the river. Highlights of Cataract Canyon by Motorboat — Traveling the Colorado River by the larger J-Rig is a stable and comfortable Utah river trip that also allows time-sensitive people to experience the remote Cataract Canyon through Canyonlands National Park. 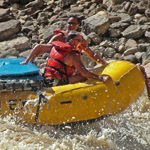 Motor to the whitewater to enjoy the world-famous Big Drops and other rapids on this Class III-V Utah river rafting adventure! Choose from 2, 3 and 4-day options. 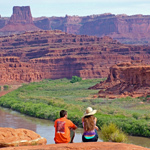 Wild Westwater Canyon Rafting — This 1-3 day trip gets you into exhilarating whitewater rapids yet has charming campsites, calm river stretches and bird-watching hikes for a classic Moab rafting vacation experience. The Colorado River in Westwater Canyon forces its way into narrow Black Granite Gorge, where 1.7-billion-year-old black rocks form renowned rapids like Funnel Falls and Skull Rapid. 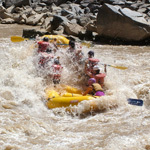 Join us for rafting the Colorado River in Moab! 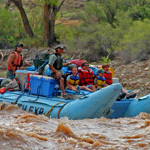 Moab Rafting (Fisher Towers Family Float) — A perfect choice for families with children 4 and older interested in a moderate Moab rafting adventure. Join us for a one or 2-day adventure on this beautiful stretch of the Colorado River, with views of red rock spires and the soaring mountains beyond. Camp on a big, sandy beach and enjoy warm water flows on this great introduction to family river rafting. River rafting is a lot of fun, but like most outdoor adventure activities, there are also potential hazards. Click here for more information about possible hazards you might experience while whitewater rafting in our beautiful canyons.